Better breeze than anticipated and aced the start with the kite up as we crossed the line first. Decent leg down the Solent to the Forts with Xara gradually overtaking us but the rest of the fleet dropping back. Tried to hitch a ride on Xara's stern wave but not really enough speed to create a workable wave. Kept in the Nab channel for a bit then headed off to Cherbourg and managed a single tack all the way. No dramas overnight and made steady progress until about two miles off the finish when the wind decided to play up which with Xara only a mile ahead lost us the win as they went straight in. 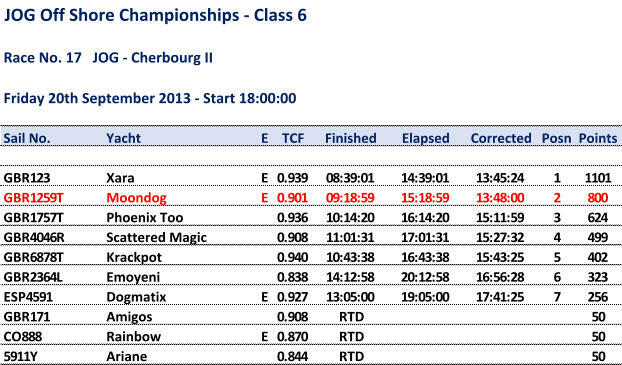 Lost out by 2 1/2 minutes on handicap which makes for an interesting situation as second place means we are now on equal points with Xara for the overall championship and there doesn't appear to be anything in the rules to govern a tied series.